Senators amended and advanced the state’s $8.9 billion budget package May 4. The state budget is structured on a two-year basis, with the budget enacted during legislative sessions held in odd-numbered years. Gering Sen. John Stinner, chairperson of the Appropriations Committee, offered an amendment to LB327 on May 3 intended to cover approximately $11 million of a budget gap created in April when the state’s economic forecasting board projected an additional $55 million revenue shortfall. • reappropriate up to $1.7 million of a cash fund balance to allow the state Department of Education Division of Vocational Rehabilitation to capture up to $6.2 million in federal matching funds. A second Stinner amendment, adopted 26-5, would increase TANF funds for economic assistance to free up General Funds for post-adoption services and align estimated expenditures for the State Disability Program with historical expenditures. Stinner also offered an amendment to strike language in the mainline budget bill stating that, to the extent permissible under applicable federal regulations, the state Department of Health and Human Services (DHHS) is to prioritize the use of all funds associated with the Federal Title X Program to federally qualified health centers, community health centers, hospitals, tribal government entities and state and local government entities. Title X funds are used to subsidize Pap smears – and treatments and procedures for the follow-up of abnormal Pap smears – as well as the diagnosis and treatment of sexually transmitted diseases, cancer screenings and family planning services. General funds provided under Title X cannot be used to perform, facilitate, counsel or refer for abortion services. Stinner said the language, which was the source of extended debate on general file, was a “poison pill” that should be removed from the budget. An attempt to change policy on Title X could be studied over the interim and introduced as a bill next session, he said, which would ensure a more informed debate that would include stakeholders and experts. 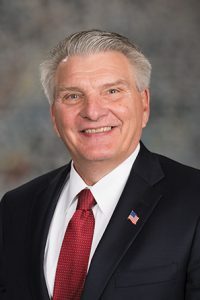 Sen. Jim Scheer of Norfolk, speaker of the Legislature, urged adoption of the amendment, saying the placement of the language in a budget bill was intentional and inappropriate. “This is the wrong way to do business,” he said. The amendment originally failed on a 22-20 vote. Lincoln Sen. Kate Bolz filed a motion to reconsider that vote and the amendment was adopted on a second vote of 25-19. Also considered was an amendment offered by Omaha Sen. Joni Craighead, which would have added public or private health care facilities that provide comprehensive primary care in addition to preventive care services to the Title X language in LB327. Craighead said the amendment would guarantee that no clinics in rural Nebraska would close due to the prioritization outlined in the budget bill. However, Omaha Sen. Sara Howard said the proposal likely would violate federal regulations. The amendment failed on a 22-12 vote. Twenty-five votes were needed for adoption. Bayard Sen. Steve Erdman then offered an amendment that would have replaced the bill with the budget amounts in effect for fiscal year 2016-17 as amended in LB22 – a budget-cutting bill passed earlier this session that made additional cuts to the budget for the current fiscal year. The amendment also would use the Cash Reserve Fund to pay for state employee salary increases that were negotiated through collective bargaining and health insurance cost increases for the current biennium. Calling the economic forecasts on which the state budget is based “a guess,” Erdman said it is unlikely that Nebraska will see the kind of economic climate in the next two years that would justify the 1.3 percent growth rate reflected in the Appropriations Committee’s proposal. 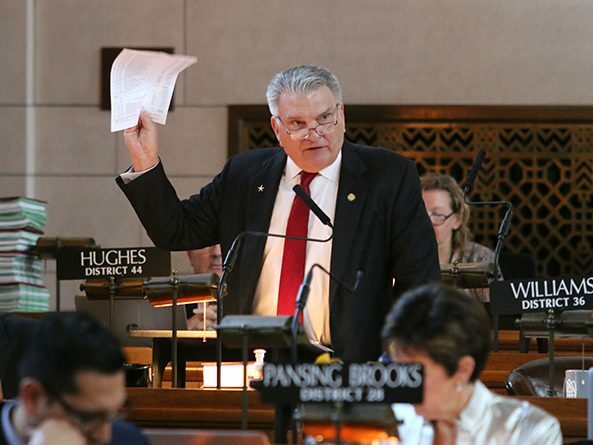 Henderson Sen. Curt Friesen supported the amendment, saying the state will face an even deeper budget crisis in two years unless senators hold the line on spending. “Somewhere along the line we have to say that we have to address our spending problem here,” Friesen said. While agreeing that expenses need to be addressed, Sen. John McCollister of Omaha opposed the amendment, saying the state needs to use a scalpel rather than a “meat cleaver” when doing so. In addition, he said, lawmakers should look at the revenue side of the equation and examine Nebraska’s use of tax incentives as an economic development tool. “These incentives are coming back to us as credits and destroying our budget,” McCollister said. The Erdman amendment failed 19-10. Twenty-five votes were needed. LB327 then was advanced to final reading 28-18. Also amended and advanced was LB330, which would appropriate funds for reaffirmed and new capital construction projects. Stinner offered an amendment, adopted 33-0, that would transfer authority for construction projects at the Central Nebraska Veterans’ Home and Western Nebraska Veterans’ Home from the state Department of Health and Human Services to the state Department of Veterans’ Affairs. LB149, which contains adjustments to the state’s budget for the current fiscal year. Select file debate on the remaining budget bills took place May 4. Stinner offered an amendment to LB331, which would create funds and make certain fund transfers, that would lower the state’s minimum cash reserve requirement to 2.5 percent for the current biennium. Nebraska law requires the state to maintain a reserve of no less than 3 percent in excess of the state’s appropriations and obligations. Stinner said the reserve requirement would go back to 3 percent for the next budget cycle. The reserve requirement has been altered in the past, he said, to adjust for difficult economic times. The temporary reduction is a better alternative than transferring additional funds from the Cash Reserve Fund to the General Fund, he said. The amendment also would reduce a transfer to the Water Sustainability Fund by $1.2 million in FY2018-19. Stinner said the changes would close the remaining $43 million budget gap created by April’s lowered revenue projections. The result, he said, would be a balanced budget that preserves the state’s priorities. “This had to be done with cuts; this had to be done with imagination; this had to be done with the rainy-day fund,” he said. But Sen. Dan Hughes of Venango argued that the budget should cut deeper. The state’s agricultural producers are “on our knees,” he said, while university administrators are paid “huge” salaries. State agencies should start transitioning to lower budgets based on actual revenues, he said. Lincoln Sen. Kate Bolz, vice-chairperson of the Appropriations Committee, said senators wishing to make further cuts should offer a specific proposal to do so. Gothenburg Sen. Matt Williams defended the university, saying its campuses across the state will be an important factor in growing Nebraska out of its current economic slump. Highly paid administrators should be considered in context, he said. Sen. Brett Lindstrom of Omaha noted that additional cuts to the university – which he said trains most of the teachers in the state and provides affordable and accessible education – would be counterproductive in the long term. The Stinner amendment was adopted on a 32-15 vote. LB171, which would provide for payment of claims against the state. Final reading debate on the budget bills is scheduled for May 8 and 9.